The Independence class light carrier USS Monterey (CVL-26) is seen at Eniwetok on September 6, 1944, wearing camouflage 33/3D. The vertical colors are navy blue, haze gray and pale gray. USS Monterey (CVL-26) seen again at Eniwetok on September 6, 1944, wearing camouflage 33/3D. 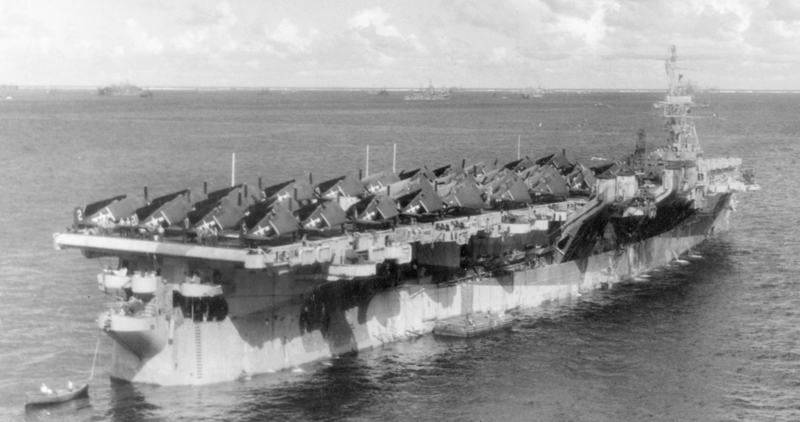 USS Monterey (CVL-26) at Ulithi on November 24, 1944, wearing camouflage 33/3D as seen from USS Wasp (CV-18). Notice how the shadows from overhangs break up the camouflage pattern. Photo source: NARA 80-G-290628.